Established as a national monument in 1911, Devils Postpile National Monument is a spectacular sight to see, and its in Mammoth's backyard! This area is home to a great variety of wildlife, including mule deer, white-crowned sparrows, pine martens, black bears and coyotes. Colorful wildflowers - such as the Alpine Shooting Star - fill the fields in the spring and summer, and winter offers hike-in-only access for those seeking adventure. 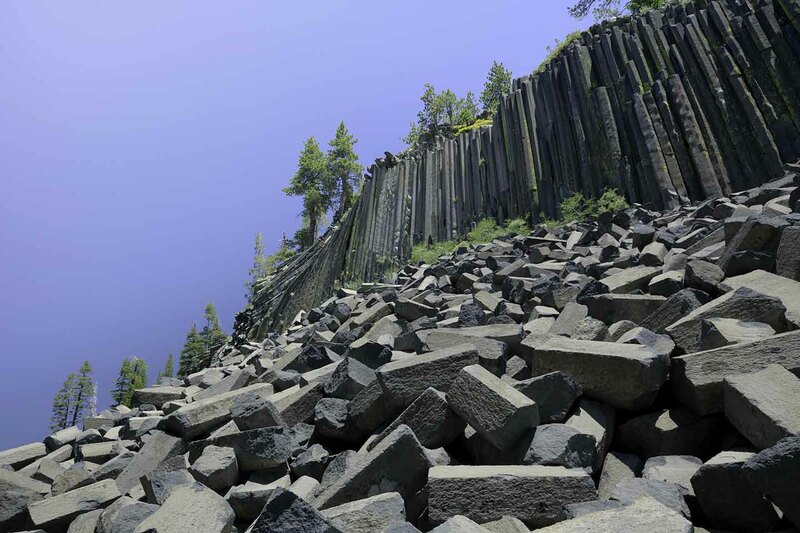 Apart from wildlife and foilage, the geological history of Devils Postpile National Monument is what makes it a truly special place to visit. Around 100,000 years ago Basalt lava (which is much hotter and has a lower viscosity than regular lava) began to flow down valley from Upper Soda Springs and was blocked by a natural dam. This created a 400 ft deep lava lake that cooled into solid rock. As it solidified it began to crack, forming the jointed columns that provide such mysterious beauty today. The baslt columns are likely what you've seen pictures of if you've been researching Devils Postpile National Monument. They are the huge column-like formations that jut out from the ground, giving the area its unique and mysterious feel. You can view these formations from all around, and you can even walk on top of some of them. When viewed from the top, they look like pentagons lined up neatly to create the perfect walking path. 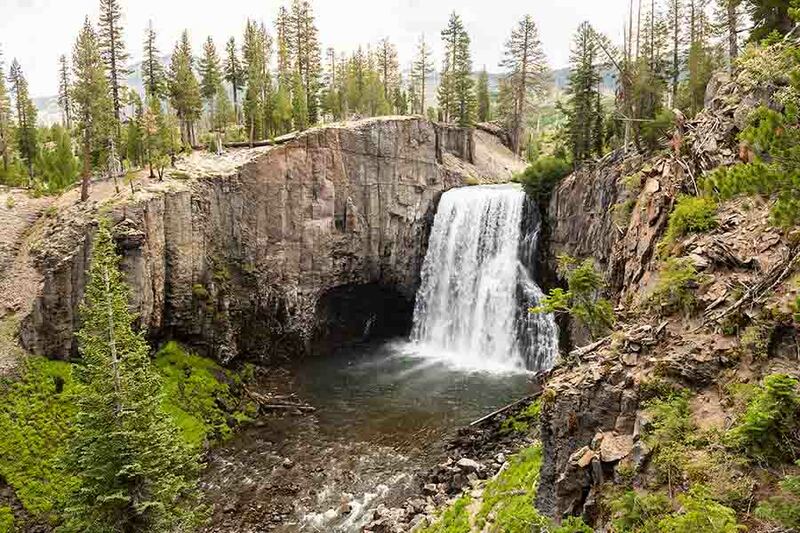 We love any waterfall hike, but Rainbow Falls at Devils Postpile National Monument is one-of-a-kind. At 101 feet, this is the highest waterfall on the Middle Fork of the San Joaquin River. On sunny summer days, you can see spectacular rainbows crossing in and out of the mist from the falls. In the Summer - take the mandatory shuttle bus from Mammoth Mountain Ski Area's Adventure Center. The shuttle will take you to Devils Postpile National Monument, and from there it's just a 1/4 mile hike. In the Winter & Year Round - In the winter there is no shuttle bus, so the only way in is trekking in yourself. You can do this year round if you please. The best route is to hike over Mammoth Pass and into the Reds Meadow Valley. Mammoth Lakes offers abundant outdoor opportunities. When you stay at Mammoth, you'll be day trip distance to four amazing national parks and historic sites. Make your dream vacation a reality now by reserving your Mammoth Lakes rental home.